The level of contractor’s HSE is a major concern in outsourcing of the works for large organizations. In each tender a rational level of HSE holding by the contractors is recommended to reduce the project costs. By investigating the classification procedure of the contracts available in reliable manuals and models at international level, 6 main criteria were selected for determining the contract level from the viewpoint of HSE. Also, an indicator, called "contract separation" was proposed by weighting the criteria. Initial weight of the main criteria along with their scoring in this indicator was determined by applying sub-criteria characteristics, namely "specialized workforce", "man-day required for meeting the criteria", "required technology", and "impact of criterion on planning the next steps of the contract". Then, by preparing a questionnaire and applying the experts' opinion, the final weight of the criteria was specified, based on which all the contracts of Shahid Tondgouyan Oil Refinery Company in Tehran were divided into four levels, namely (1) advanced, (2) moderate, (3) basic, and (4) exempted from the initial HSE assessment. 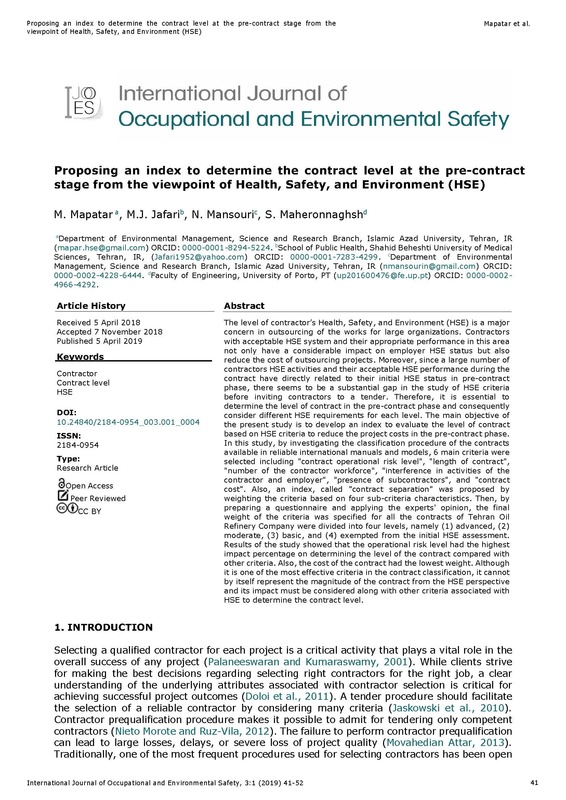 Results of the present study showed that the operational risk level had the highest impact percentage on determining the level of contract compared with other criteria, which indicates that regardless of other criteria, in case the level of contract risk is high, some special HSE measures should be planned for that contract according to the advanced contracts. Also, cost of the contract had the lowest weight; although cost of the contract is one of the most effective criteria in the contract classification, it cannot by itself represent the magnitude of the contract from the HSE perspective and its impact must be considered along with other criteria associated with HSE in order to determine the contract level. The manuscript I'm submitting for review is original, has been written by the stated authors and has not been previously published. While under review by this journal, the manuscript was not submitted for review to another journal and will not be submitted to any other journal. The manuscript does not infringe any copyright, violate any other intellectual property, privacy or other rights of any person or entity, or contain any libellous or other unlawful matter. I have obtained written permission from copyright owners for any excerpts from copyrighted works that are included and have properly credited the sources. If I am using any personal details or images of patients, research subjects or other individuals, I have obtained all consents required by applicable law. Any software contained in the Supplemental Materials is free from viruses, contaminants or worms. I hereby grant to IJOOES an exclusive publishing and distribution license in the manuscript identified above and any tables, illustrations or other material submitted for publication as part of the manuscript in print, electronic and all other media (whether now known or later developed), in any form, in all languages, throughout the world, effective when accepted for publication. IJOOES will apply the Creative Commons Attribution-4.0 International License (CC BY) to the submitted manuscript on an Open Access basis. The CC-BY license allows users to copy, to create extracts, abstracts and new works from the published manuscript, to alter, revise and to make commercial use of the it, provided the user gives appropriate credit (with a link to the formal publication through the relevant DOI), provides a link to the license, indicates if changes were made and the licensor is not represented as endorsing the use made of the work. The full details of the license are available at https://creativecommons.org/licenses/by/4.0/.